We didn’t see much of Hawaii past the beaches and hotel when I was a kid, but I’ve been longing to go back as an adult and experience all of the wonderful hidden food gems the Island is known for. 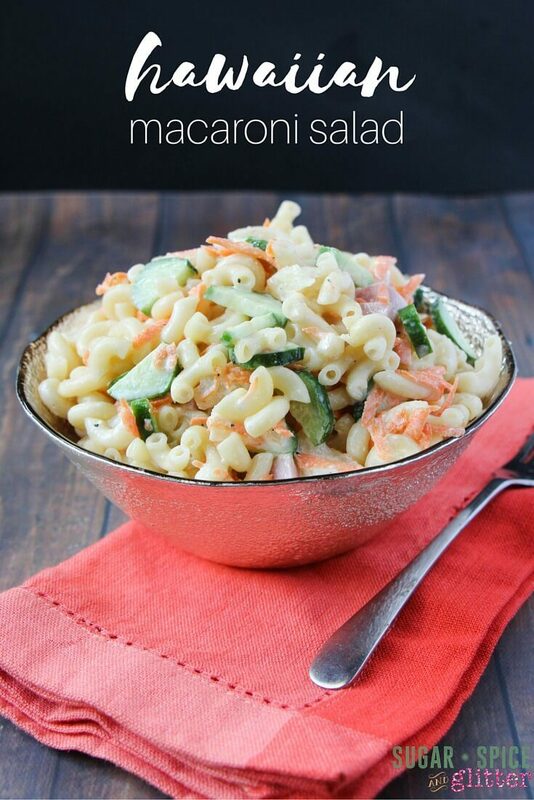 Mom & pop joints and food trucks are where I’m going to head to really experience Hawaiian food culture – but for now, this salad is tiding me over. 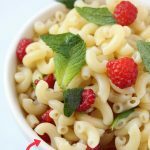 This easy cold pasta salad recipe is fresh and slightly sweet, thanks to a hit of pineapple juice. 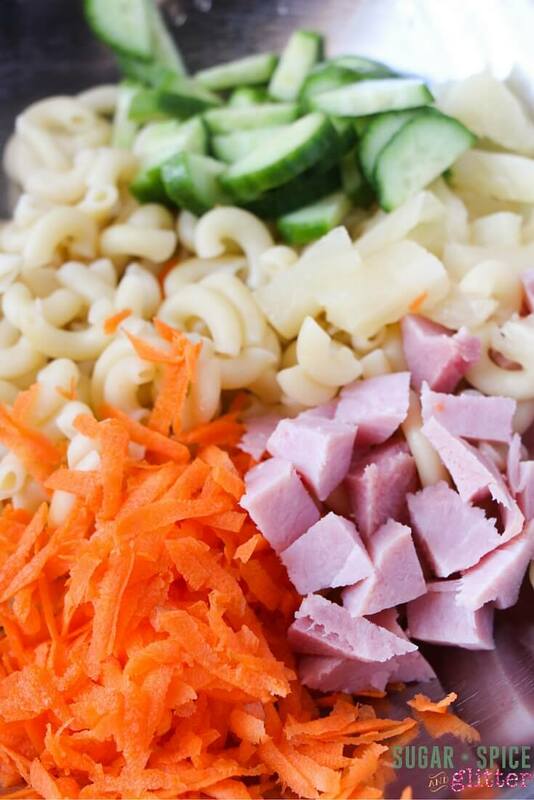 Even when left to marinade overnight the vegetables stay crunchy – providing a great contrast to the soft, perfectly cooked noodles. 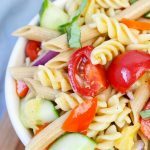 Of course, you can use any pasta to make this salad, and you can swap out the vegetables I’ve suggested here for ones your crew is more likely to eat. 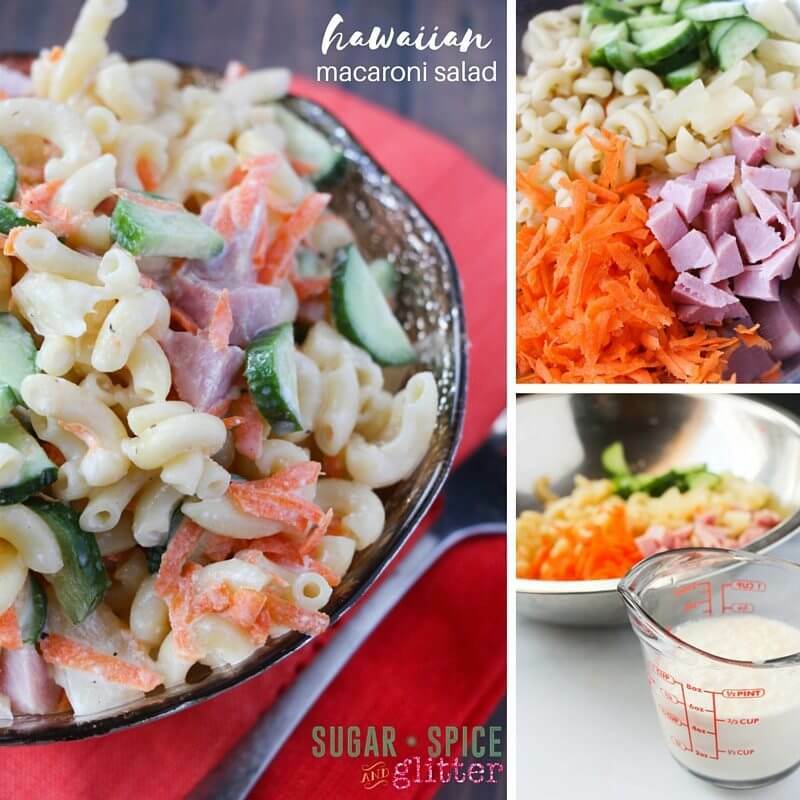 I added some leftover ham from our Honey-caramel ham recipe because that just seemed more authentically Hawaiian to me – well, maybe not as authentic as Spam but I’m not that brave! Chicken or even tofu would work well, too. 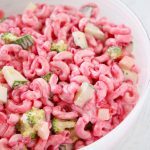 My kids devoured this salad and our pink pasta salad version at Ella’s Sleeping Beauty party was a hit with our grown-up guests, too! 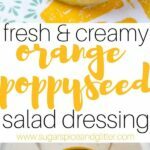 Combine all ingredients except salt and pepper in a bowl and set aside while you whisk together the pineapple dressing. Taste and adjust as necessary – adding more juice, sugar, or vinegar to hit that perfect balance of tart, sweet & creamy. Pour the dressing over the pasta and stir until completely coated. 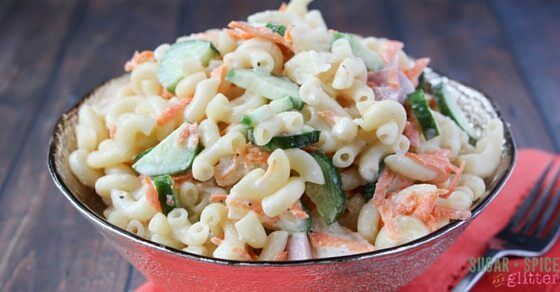 In a large bowl, combine macaroni, pineapple, ham, carrots, and cucumber in a bowl. 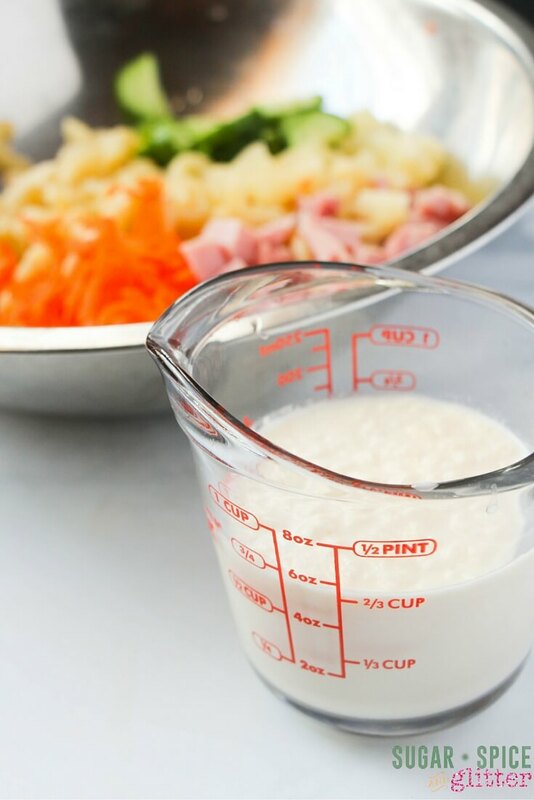 In a small bowl or measuring cup, whisk together the mayonnaise, greek yogurt, cider vinegar, and sugar. 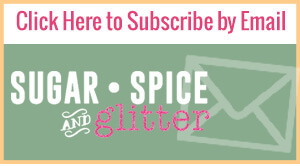 Taste and adjust as necessary. Pour the dressing over the pasta, and stir to coat. Check out our other delicious salad recipes for more healthy options, like our mayo-free Caesar salad and our Sunshine bowl with quinoa and a poached egg on top!